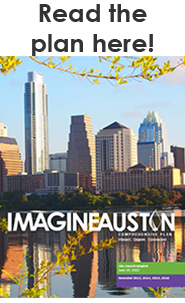 A priority program in Imagine Austin is to revise Austin's development regulations and processes to promote a compact and connected city. Demographically speaking, Austin continues to experience profound change. Keeping up with how these demographic shifts affect the City is essential to successful operations and planning. This page acts as a portal to a large collection of demographic maps and a wide array of demographic data. Austin's demographic story continues to revolve around the three major themes of: 1) rapid and sustained job and population growth; 2) transformative demographic diversification; 3) and, stubborn structural and spatial socioeconomic separations. The Downtown Density Bonus Program (DDBP) was established in 2014 to promote a vibrant, dense, and pedestrian friendly downtown area while also encouraging the development of affordable housing and other community benefits. A downtown density bonus can be requested as part of a site plan review process. . The Historic Preservation Office protects and enhances neighborhoods, buildings, and sites that reflect elements of Austin’s cultural, social, economic, political, and architectural history. The Planning and Zoning Department (PAZ) supports implementation of of long range plans, including adopted neighborhood plans through various activities. Long range planning provides an opportunity for community members to shape the neighborhoods where they live, work or own property, while addressing land use, zoning, transportation and urban design issues. The Long-Range CIP Strategic Plan looks out into a 10-year or longer planning horizon and provides the basis for identifying both ongoing capital needs and strategic opportunities for capital investment. The Long-Range CIP Strategic Plan is a document produced by the City of Austin and released each spring that takes a data-driven, collaborative approach to long-range planning for the Capital Improvement Program. Download a one-pager about the Plan. These programs below help manage traffic and parking across the City of Austin. Urban Design is the process of shaping a city’s physical form. The principal elements that Urban Design examines include: parks, open space, and other places that people may gather: streets, sidewalks, and walkways; bridges and water bodies; historical features; trees and landscaping; and lighting and signage.